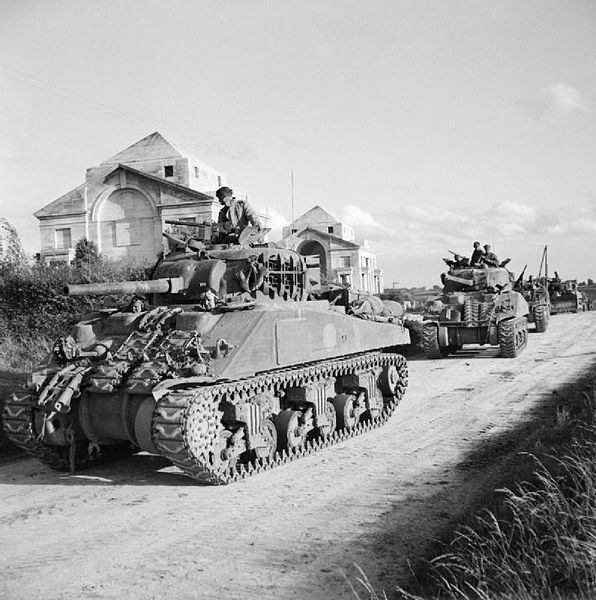 Among the multi-national Allied forces that participated in the campaign following Operation Overlord on D-Day on June 6, 1944 were the British Guards Armoured Division. Arriving a couple weeks late to the party on June 26, the Guards would roll on to participate in many of the key post-D-Day engagements including Operation Goodwood, Operation Market Garden and the Battle of the Bulge. 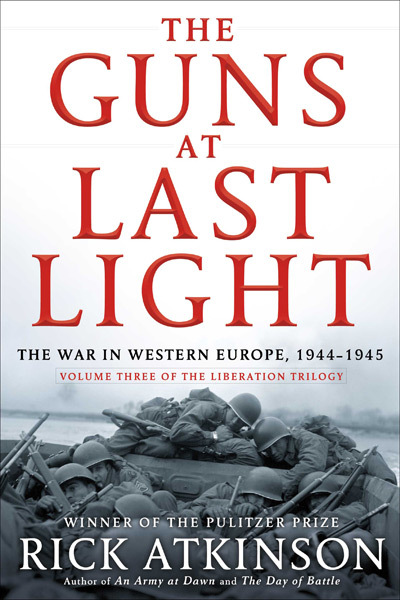 I’ve been encountering the Guards over and over again in Rick Atkinson’s engaging The Guns At Last Light, the latest and final volume in his “Liberation Trilogy” telling of the Allied march to victory in World War II. 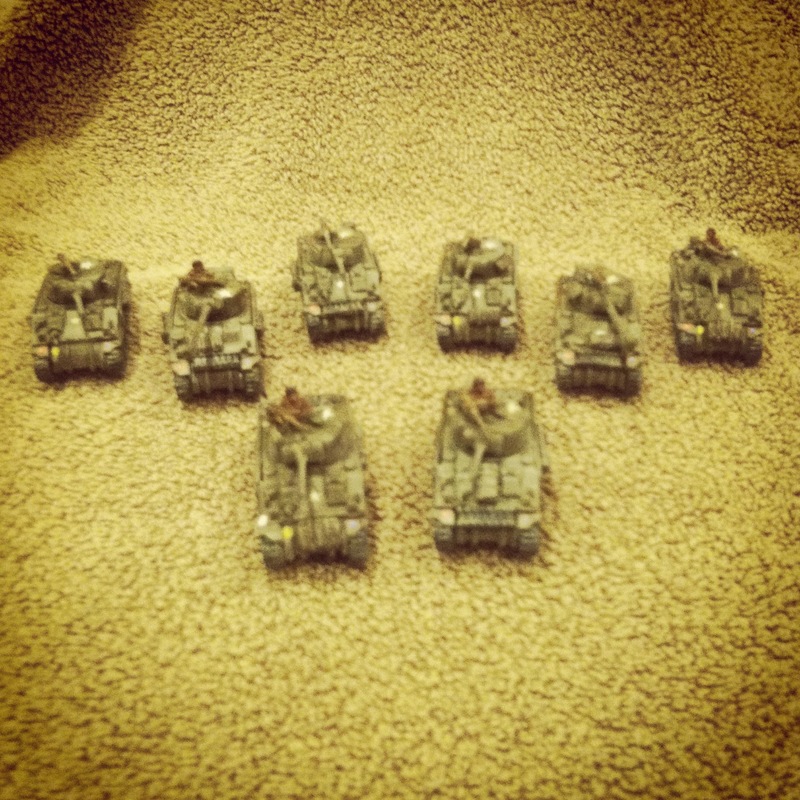 And so, it is great timing that I’m finally getting around to adding the Guards as my first allied group supplementing my already extensive US forces in my Flames of War gaming. 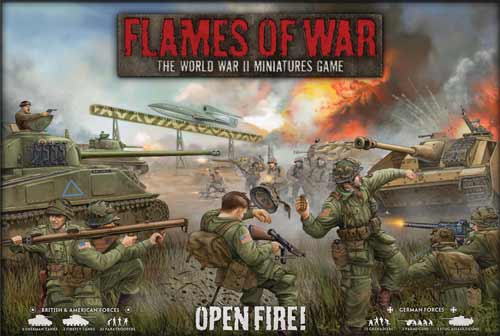 I’ve been working away for half this year on finishing up the models included in the excellent Flames of War Open Fire! box set. Among all the plastic goodies included, the set offers up a nice Guards platoon to provide support to their allied US Airborne infantry. The eight models include six of the US-supplied Sherman V tanks and two of the famed Sherman Firefly tanks, retrofitted by the British with a massive 17-pound anti-tank gun. Aside from a rather significant and well-documented issue with some parts fitting together, the models glue up pretty nicely. To the included stowage and gear included on the sprues I also added some leftover bits. A quick coat of green armor spray paint followed by black and silver lightly brushed on the treads made up the majority of the painting work. The exposed drivers received a tan uniform, black beret and radio headset picked out in detail. Crates and tool handles strapped to the hull got a quick touch of brown. For decals — a big oversight in not being a part of the Open Fire! kit — I used a set from the Plastic Soldier Company and guidelines found on the Flames of War site. I found the decals from PSC to be easier to apply than those I had used from FOW in the past, but I did still use a few Allied “star” markings I had lying around from previous US tank models from FOW. 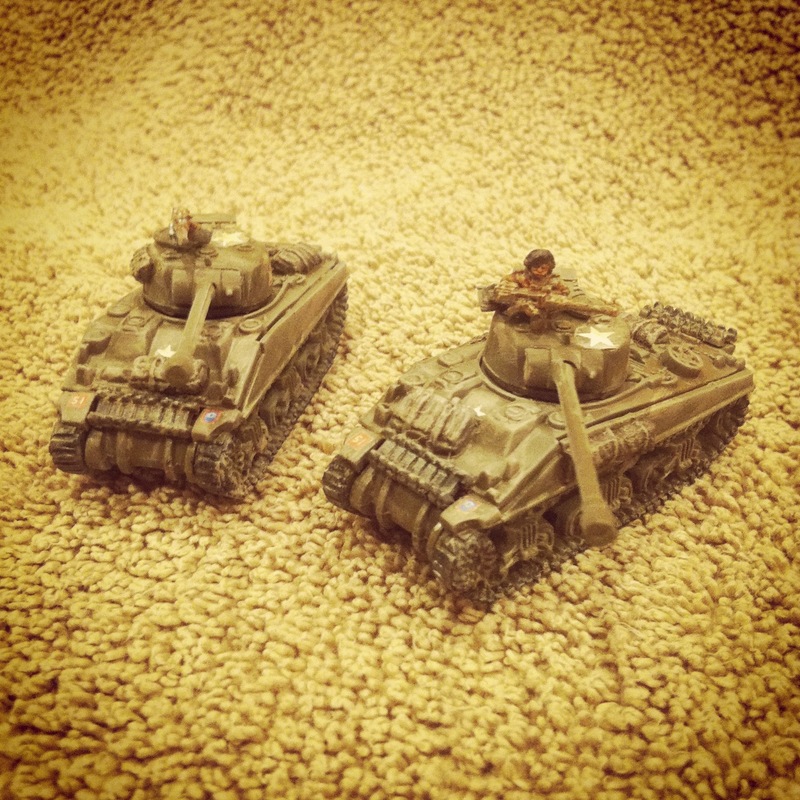 With the decals dry, a bit of dried mud color and watered-down brown wash added some wear and tear around the tanks before they were hit with a matte finish. Now that I’ve got some Brits on the table, I’m eying some UK infantry to add some depth to my collection and flavor to my games. 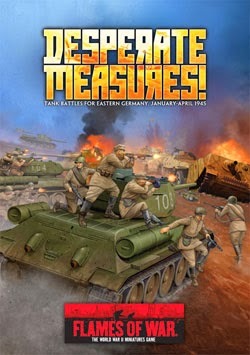 There’s a big full-day Flames of War gaming event coming up in just a few days at Metropolitan Wargamers, but I don’t think the Guards will be making an appearance this time around. Still, it will be good to know they’re waiting to throw in with the Yanks on another day in the near future. 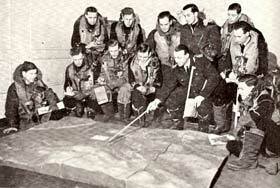 Behind him in the cockpit of the Model Room lay an immense plaster relief map of the Normandy coast where the river Seine spilled into the Atlantic. Thirty feet wide and set on a tilted platform visible from the back benches, this apparition depicted, in bright colors and on a scale of six inches to the mile, the rivers, villages, beaches, and uplands of what would become the world’s most famous battlefield. A brigadier wearing skid-proof socks and armed with a pointer stood at port arms, ready to indicate locales soon to achieve household notoriety: Cherbourg, St.-Lo, Caen, Omaha Beach. 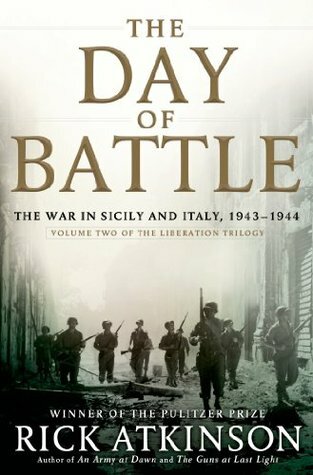 Over the next several hundred pages, Atkinson’s book goes onto to recount the trials, travails and eventual success of Operation Overlord and the eventual Allied victory in Europe. Although I’ve read accounts of the period before, the book is incredibly gripping and moves surprisingly briskly. 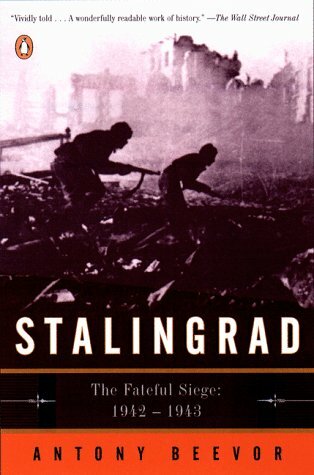 In reading though, my mind keeps wandering back to that brief description of that enormous model of the invasion laid out before so many great military leaders nearly 70 years ago. 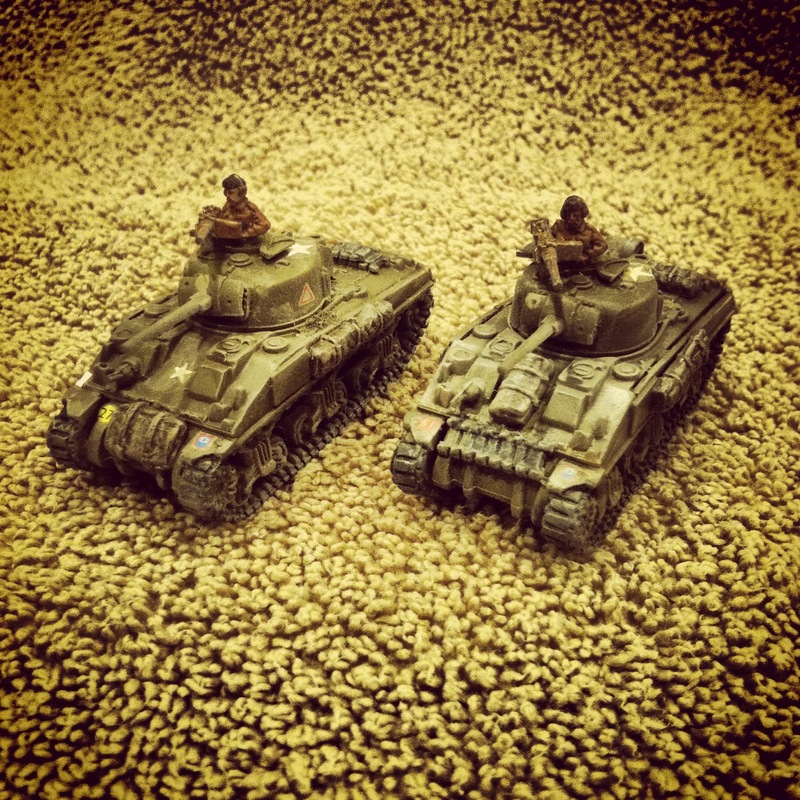 No one knows for certain when terrain models were first used in warfare. One might easily envision some leader of a primitive warband arranging sticks in the dirt before his subordinates as a way of planning for an upcoming attack on a rival force. What we do know is that by a few hundred years ago models were being used frequently by commanders and in military schools throughout Europe. 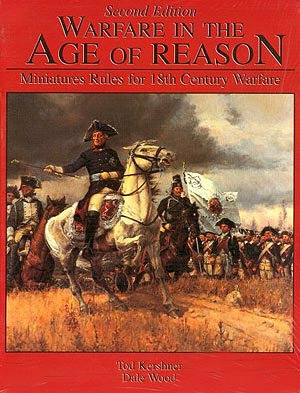 It was out of these same elite war colleges that modern miniature wargaming would eventually spring. It’s from this place where my mind keeps turning back to that plaster model in 1944 London. As a wargamer, I’ve previously written here about my passion for creating a well-laid-out terrain board for my gaming. 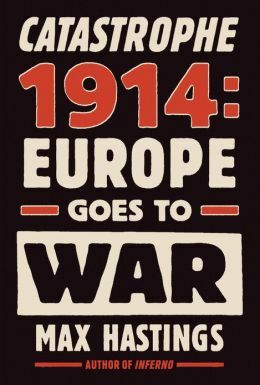 With a bit of digging around online, I managed to uncover quite a few resources outlining the this bit of military craftwork and its importance in 20th-century war planning. Terrain Models, a joint Swiss-American scholarly site dedicated to the European history of military topographic modelling, gives a great overview of how the tradition grew through the ages. With a bit of a slant toward Swiss model-making history, the site does provide a lengthy bibliography, a rundown of model types and a number of photos (sample, right). 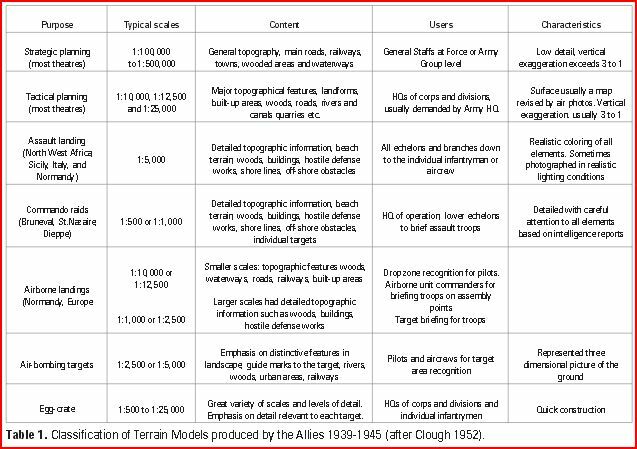 In a 2002 article entitled “Allied Military Model Making During World War II” from the journal of Geography and Geographic Information Science, English lecturer Alastair W. Peterson also offers a bit of historical context before detailing the specific importance of models to Allied forces in WWII. Peterson outlines the evolution of methods and materials and also presents a nice chart of common scales and military uses for each (below). The article also presents personal accounts of the people recruited for model making during the war, and the challenges they too faced far and away from the actual fighting. A recent interview in the Cleveland Plain Dealer provides another set of remembrances from a veteran who spent the war making topographic models, including one used ahead of the Normandy invasion. Other discoveries I made include a 1945 Universal Newsreel entitled “Secret Maps Guided US Bombers” which offers up a rare behind-the-scenes look at the construction of massive 80 foot 3D map used in planning late war air raids on Japan. 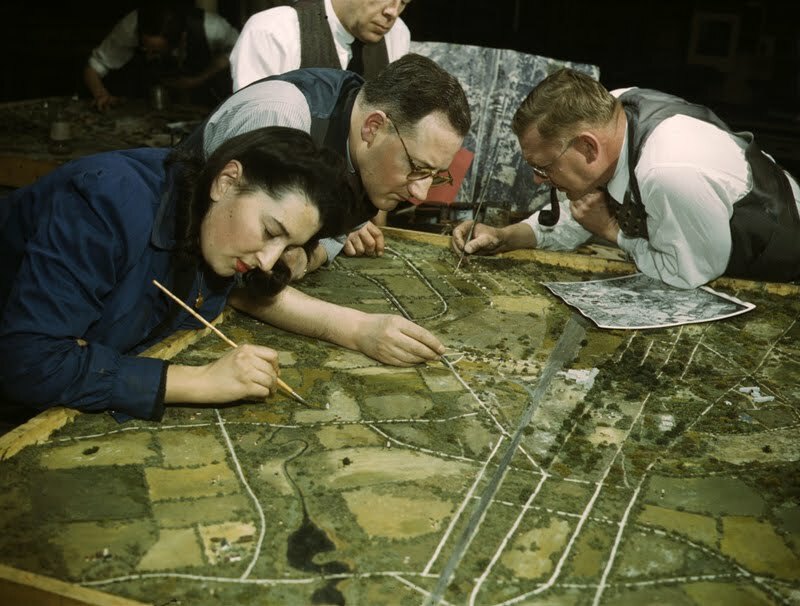 And the undated color photo at left shows what purports to be a group of students learning techniques in creating a terrain map for military use during or immediately following WWII. The articles, sites and photos I’ve uncovered give a cursory overview of military terrain making and their role in WWII. There are some lost gems I’d like to dig into more, including tracking down an actual copy of the 1956 US Army training manual Terrain Models and Relief Map Making (TM 5-249) which is referred to in a number of online bibliographies. But for now, I’ll carry all this history with me as I lay out my next wargaming battlefield in the context of all the historic importance many of the same skills and techniques have played in the wars of the past.